This was an early reviewer book, and I was so excited to receive it. However, for whatever reason, this book took me FOREVER to read. The first 200 pages just seemed to drag on and on, with not much happening. I'm glad that I stuck with it though, as the story did pick up in the last quarter of the book. The Physick Book of Deliverance Dane tells two stories. Connie Goodwin is busy preparing to write her PhD dissertation on American History when she gets the call from her mother to help clean her grandmother's house and get it ready to sell. Connie reluctantly agrees to help her mother, and in doing so discovers a rolled up piece of paper that is inserted into a key that is found in an ancient family bible. On the piece of paper is written a name, Deliverance Dane. What Connie soon discovers is that Deliverance Dane may be a previously unknown Salem witch, and what ensues is her journey to discover the location of Deliverance's recipe book and the secrets that are hidden within. The second story is that of Deliverance and her descendants. I really enjoyed the historical setting for Deliverance and her family. I found that portion of the book to be very well written and since there isn't much to tell, per se, that portion of the book moved along quite well. However, it was during the bulk of the story that dealt with Connie that I felt the story to drag on. I wouldn't even know what I could put my finger on that would make the story move along. All the characters have their roles to play, and they are all believable, but the story just didn't seem to move, at all, for the first 200 pages of the book. As the pieces of the puzzle started to fall into place during the last quarter of the book, however, I was glad that I stuck with it as the story moved along. What makes the historical aspect of the story even more interesting is the fact that the author, Katherine Howe, is a descendent of two of the actual Salem witches, Elizabeth Howe and Elizabeth Proctor. The scenes that dealt with the witch trials were very well written, really giving a sense of the mania that had swept through the village and surrounding area. I can honestly say that I enjoyed these interludes even more than I did the rest of the book. I'd like to see Katherine Howe expand these sections into an actual retelling, fictionalized or not, of the Salem witch trials. I think that she could create a very accessible account of the hysteria and trials of 1692. 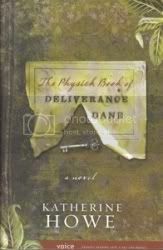 Overall, The Physick Book of Deliverance Dane is not a bad book. It is thoroughly researched, and you can tell that Katherine Howe really loved her characters and this story, but the book could have benefitted from faster pacing. If you are a fan of witches, or are interested in the history and stories behind the Salem witch trials, I don't think that you'd be disappointed in this book. Release date June 9, 2009.